Airstrips: Boston Brook, Budworm City, Charlo, Dunphy, Juniper, Tabu, Taxis, Grog Brook, Horne’s Gulch, MacFarlane, Nictau, Renous, Rose Hill, Sevogle. No new airstrips were built. 190 Stearman, based on a 4-page list with parts unreadable or missing. The 4-page list is presented at the end. This was the biggest operation of all 15 years, thirty times larger than the first in 1952, and included 24 contractors from the US and Canada. A total of 5,195,000 acres were sprayed in New Brunswick, about 30% of the province. 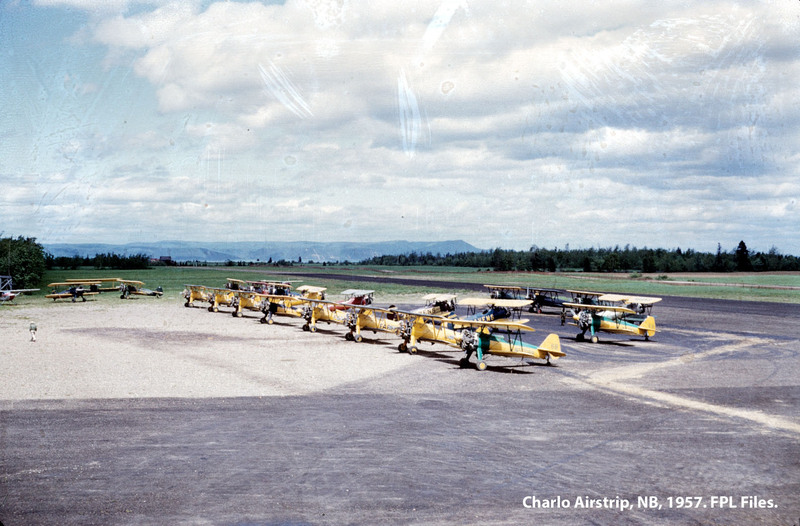 Twenty-two airfields in New Brunswick and Quebec accommodated about 200 Stearman sprayers and twenty-five Cessna observation planes. The FPL mixing plant was moved to Dalhousie on the Chaleur Bay to take advantage of its winter port facilities. The Charlo airstrip was established as the operational headquarters. A full-time dispatcher, “Rusty” Mulcahy, was assigned to keep up-to-date records on the disposition of each spray plane. 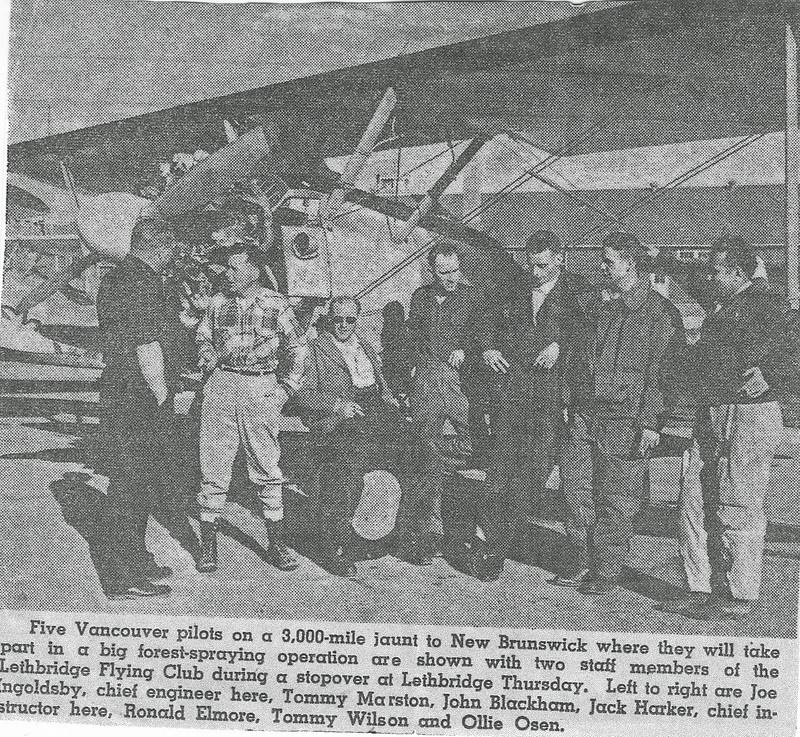 Five Skyway Air Services Stearmans on their way to NB, stopover at Lethbridge, Alberta, 23 May 1957. This was provided by Tom Wilson. Dunphy airstrip, located on the southern edge of the New Brunswick spray area, was the first to go into action, on June 4, followed by a gradual move northwards as the biologists gave the go-ahead. The entire operation came to an end in New Brunswick on July 4, when twenty aircraft operating out of Renous sprayed their last acre. Accidents: On June 20, the first fatality of the budworm project occurred. Pilot Elwyn G. Behnke, from Eagle Point, Oregon, and of Medford Air Services crashed into thick forest three miles south-southwest of Budworm City. #101 N58065 1957? Medford? Simsbury? Numbers end at #126 and restart under Marsh at #201. Here the lower left quarter of the folded sheet is missing. Ditto marks under Marsh Aviation continue for 24 more entries, but #301 is on a crease that obscures the company name. If there are no missing numbers, then they would be #302-325. Some of the registrations are gleaned from the colour images from the FPL files. Some are or may be Vince Dusters and some are Farmers’ Crop Dusters. DDT on 1,255,000 acres, Stearman. “In the peak year of operations (1957) 80 spray aircraft and 12 inspection aircraft operated from 9 airstrips constructed for this purpose.” [Blais et al. in Prebble 1975] Webb et al. (1961) state in Table 2 that 107 Stearman sprayed in Quebec. Airstrips used were Patapedia, Cap Chat, Laverendrye, Nouvelle, Lesseps and Pabos. The latter two airstrips were constructed for the 1957 project. Spraying ended on July 5. List of Stearmans in NB – FPL 1957. From Don Henry files.